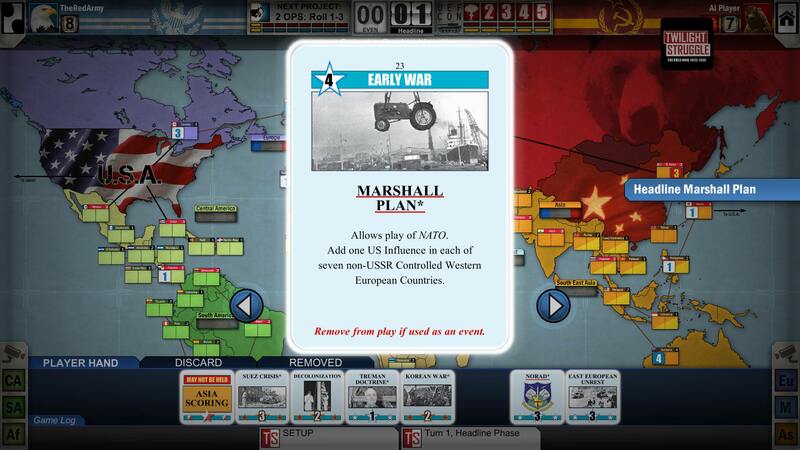 Twilight Struggle is a board game about the Cold War, between the United States and the USSR. The Cold war basically a geo-political chess match between the two superpowers, struggling to sway other nations to their preferred ideals - sometimes peacefully, sometimes violently. 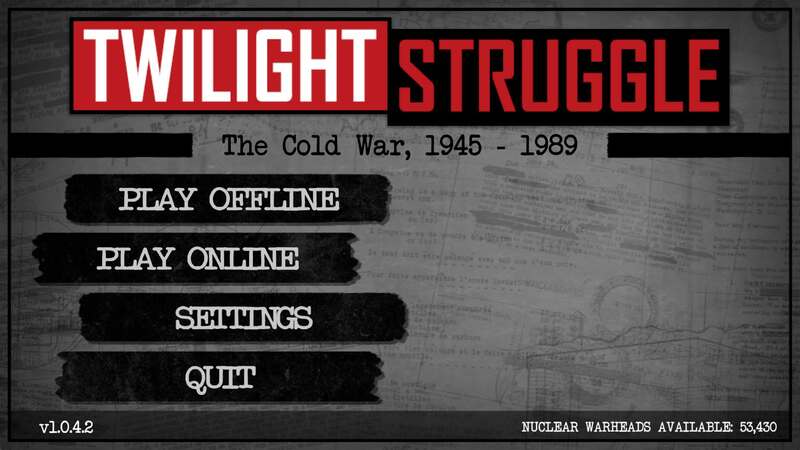 Twilight Struggle sets aside direct military combat for this struggle - exercising influence and pressure on various nations and regions to attempt to gain control. TS has one notable accomplishment - for many years, it was rated the #1 game on BoardGameGeek.com, only recently being displaced. I have been interested in the game before, but it looks extremely complex at first glance, and so I did not invest too much time into learning it. However, it's more complex in the way Chess is complex - the actions available to you are easy to remember, but the strategy is the hard part of the game. 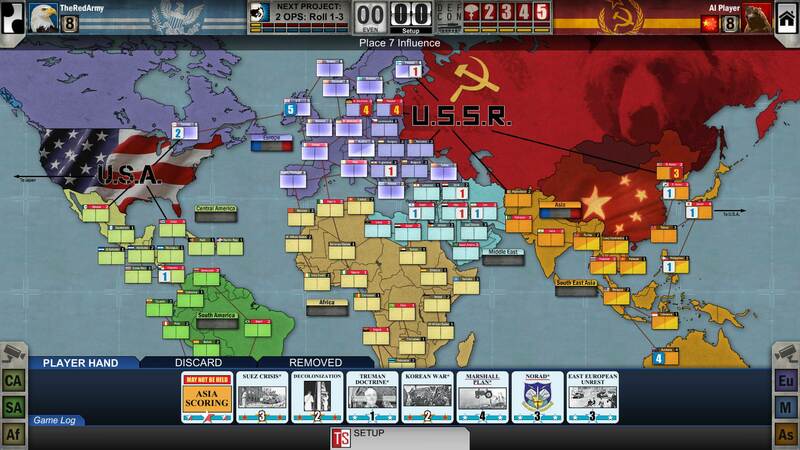 That's Twilight Struggle. The order of play is relatively simple - There are 10 turns in the game, divided into action rounds (ARs) - 6 ARs for the first three turns, and 7 for the rest of the game. Each AR has the USSR play a single card from their hand, followed by the USA. When you play a card, you may either use it for its event, or use the operations number on the card to either place influence in nations, "realign" nations to remove your opponent's influence (or your own, if the roll goes badly! ), or conduct military coups to try and seize power in a country. All the while, the ever-present threat of nuclear war hangs over both players' heads - and if you cause the nukes to fly, you lose! 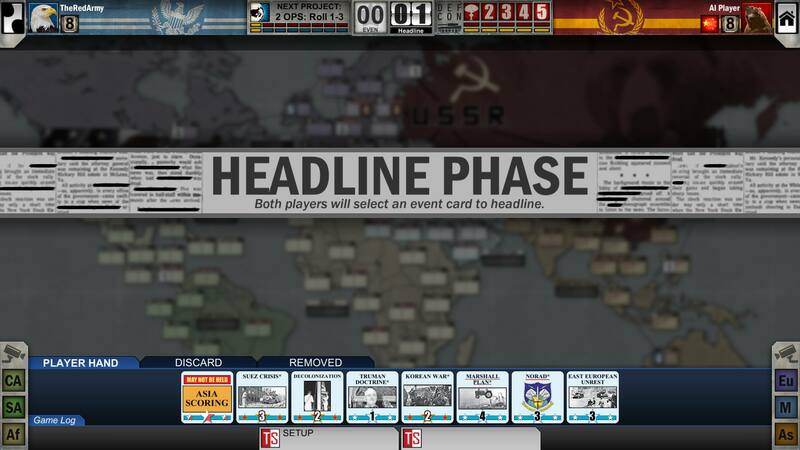 There's also a "headline" phase at the start of each turn, where both players play a single card only for the event. Victory Points are scored by playing score cards that are included in the deck - and there's almost no getting around a scoring card, because if you fail to play it by the end of the turn, you lose the game! So you have to play them when you get them, and points are awarded based on how much of a presence you have in the region. 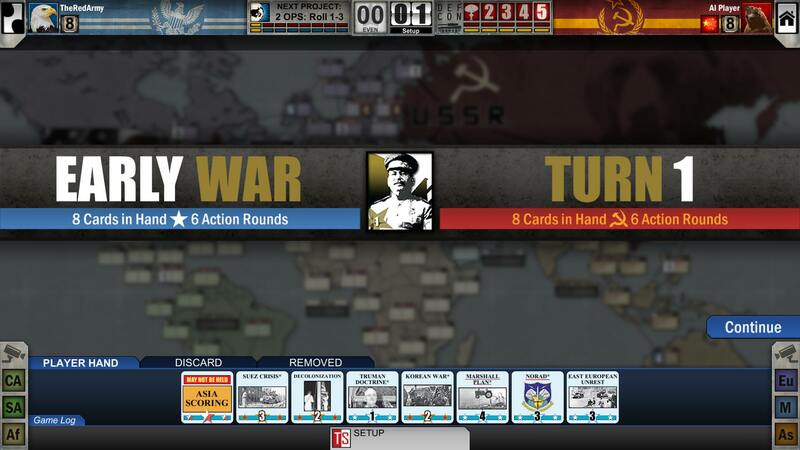 One of the main features of the game is that both players draw from the same deck of cards - with both US events, USSR events, and neutral events. You will inevitably draw some of your opponent's events during the game, and much of the struggle is trying to handle these events - you can play your opponent's cards for their operations value, but you must trigger the event if you do that! So the US is holding the "Nasser" card, which removed half of all US influence in Egypt, while adding two for USSR when used - you have to decide when to use the card so as to mitigate the damage it will do to you, and also decide if you even want to fight for Egypt, knowing you'll have to play this card sooner or later. Since scoring cards are also held in hand - and it's difficult to know if your opponent holds one or not - this can lead to a paranoia situation. Perhaps on USSR's first action round, he places some influence in the Middle East to solidify his hold there, and drops an extra he doesn't need into South America since it'll be useful eventually. The US player, acting next, eyes that "innocuous" influence placement in South America suspiciously. "Maybe he has the South America scoring card" he thinks. He also decides to drop a little influence into South America. Suddenly, USSR gets suspicious, and decides to push back a little. And then the entire turn devolves into an influence war for South America, both players sacrificing position elsewhere to fight harder in South America. In ways like this, the game perfectly encapsulates the entire feel of the Cold War. Nations and regions are important because you think it's important to your opponent. You want to push things all the way to the edge, without going over the edge. You're trying to get in your opponent's head, trying to see what he's thinking, seeing how all the seemingly unconnected moves fit together. The marriage of mechanics and theme in this game is among the best I've ever seen. The video game version of the game only improves on it. The ominous music in the background is ever-present, keeping a light level of tension. Turns roll over, showing a prominent leader of the period, along with one of their speeches in the background - men like Stalin, Truman, Breznev, and Reagan. 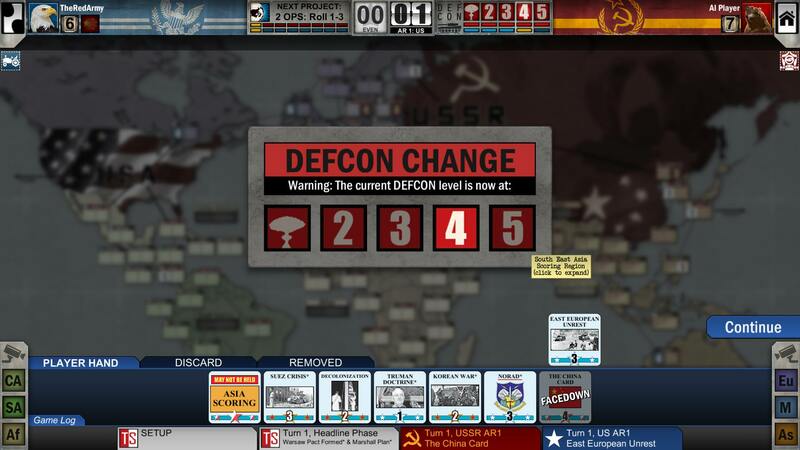 A powerful buzzing occurs whenever the DEFCON level changes, along with an unmissable pop-up. The headline phase comes up, with a little newspaper graphic, as black lines come and censor everything on the paper. Everything feels very Cold War the entire game, and the atmosphere is never lacking. An image of the game-board during pre-game setup. An image of the Marshall Plan card. This is certainly one of the best board games I've ever played now, despite never owning the physical version. Quill18 has a decent play-through of his own, if you'd like to see the game in action. I highly recommend it to fans of the period and fans of strategy games in general.